After a week of rain, a gorgeous autumn day on the Friday of the first week of October brought a perfect opportunity to go for a cruise with the top down. 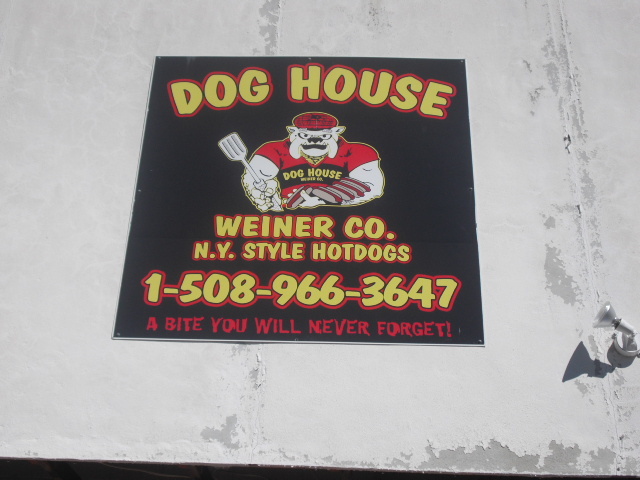 Where else to go for a cruise than Bellingham, Massachusetts, the home of the Dog House Weiner Company: N.Y. Style Hot Dogs. 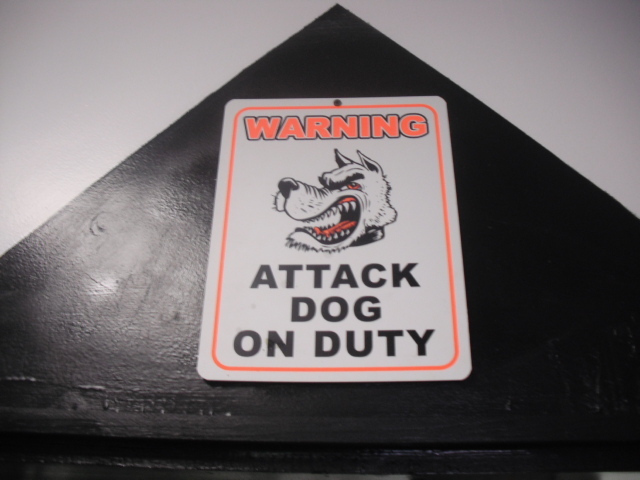 They’re located at 15 North Main Street in the aforementioned Bellingham. 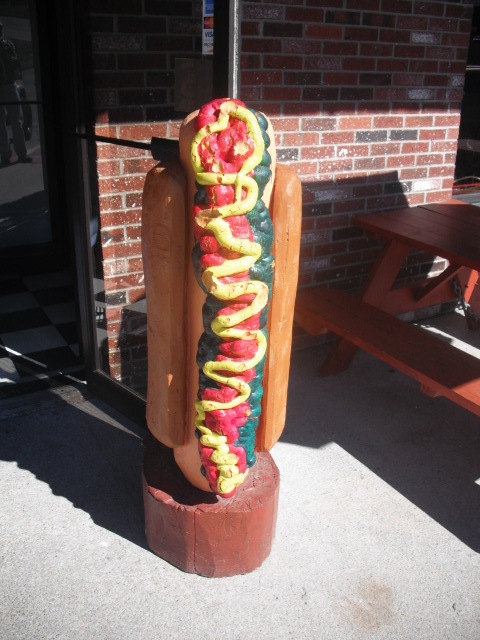 A four foot tall hot dog with the works greets you at the entrance. 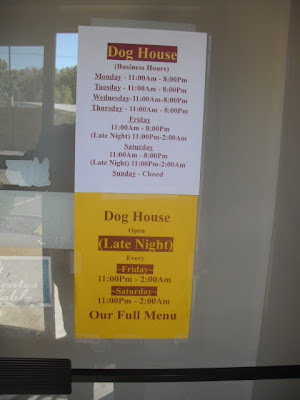 They’re open 11 AM-8PM Monday through Thursday, 11AM-2AM Fridays, 11AM-8PM and 11PM-2AM Saturdays. The place is closed Sundays and I don’t blame them; if I was up until 2AM or later on Saturday night, I’d take Sunday off too! The Dog House Weiner Company is located in a strip mall in Bellingham. 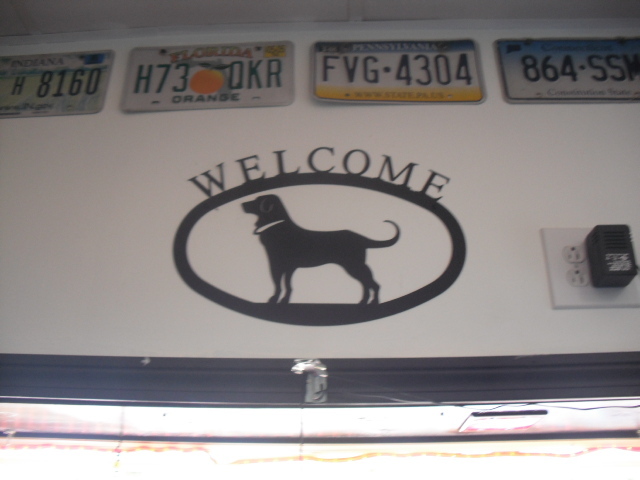 There’s a lot of renovation going on at the property, but the environs inside the joint are welcoming. At least as long as you stay out of the kitchen! I spoke with owner Adam Gagnon; Adam was feeling camera shy this day, so there’s no photo of him. He actually knew who I was. You see, he’s originally from nearby Holliston and he knows Bruce and Jeannie of Jeannie’s Weenies. They told Adam about the visit Little Miss and I paid to their hot dog cart back in August and he’d taken a look at the site and read through some of the Hot Dog Stories. I don’t know what it is about Holliston this summer: it seems to have some sort of cosmic significance in the Hot Dog Universe…. Adam was most recently in construction, but he has a food service background. He ran a “seafood shack” for six years. It’s out of business now, but he served up fried clams, fish & chips, ice cream, and, of course, hot dogs during his tenure there. Adam resides in Bellingham now and he’d been eating at the Dog House Weiner Co. for the first year and a half it was open. About 6 months ago he got wind that the business was for sale. 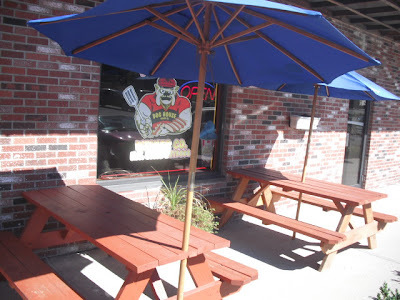 He knew he wanted to be in business for himself, he knew the food business, and he loved eating at the place, so he bought the business! The only real changes he made to the menu were to the meat sauce (a true NY hot dog doesn’t have Coney Island sauce- it has meat sauce) and the chili. He makes both toppings fresh daily. I checked out the special board…. 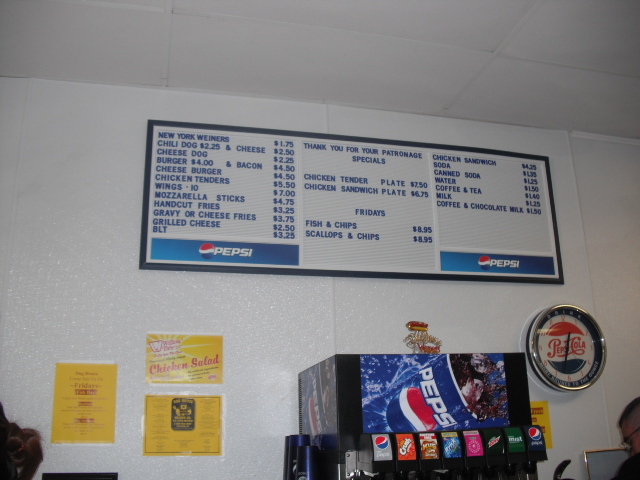 ..and the menu. There’s much more than hot dogs here. The New York Weiner Company serves all kinds of good diner style chow: burgers, chicken wings, club sandwiches, chicken and tuna salads, hand cut french fries and much more. 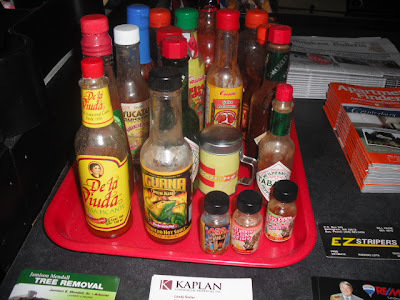 For those folks who like to spice things up, there are over a dozen varieties of hot sauce to douse your dogs with. They have an outdoor piazza for your dining pleasure. 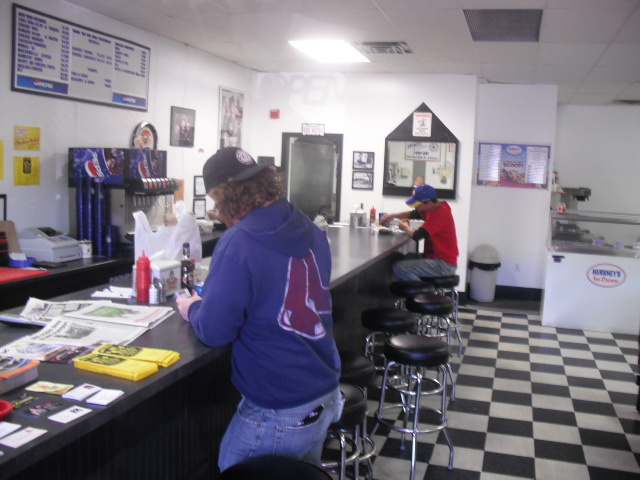 There’s also plenty of counter seating-reminiscent of an old school diner- and some tables and chairs. Friday is Fish Day and today’s special was a fried scallop plate. I took a picture of one patron’s scallops, but I had my daughter’s camera (my batteries were shot) and I pushed the wrong button. 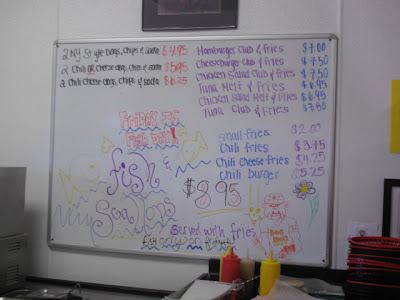 The scallop plate was heaped with a half a pound of fried scallops and the Dog House Weiner Company’s hand cut french fries. 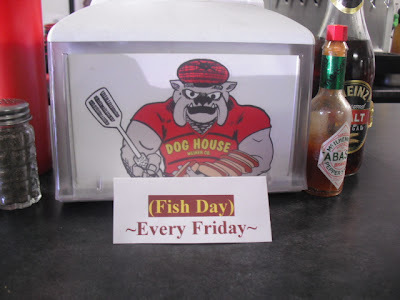 This aint fish stories: I was here for hot dogs! They serve up a steamed Kayem Old Time Frank on a steamed bun at the Dog House Weiner Company. The standard condiments are available: brown and yellow mustard, ketchup, onions, relish. The real specialty of the house is the homemade New York style meat sauce (they don’t call it Coney Island Sauce in New York) and the homemade chili. 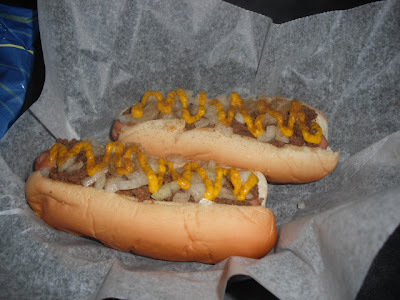 I opted for two New Yorkers topped with the meat sauce, onions, yellow mustard and celery salt. Those are two good looking dogs, eh? These were superb. The meat sauce was reminiscent of the Archie’s on Roll Michigan Sauce, but a tad milder. I was still hungry. 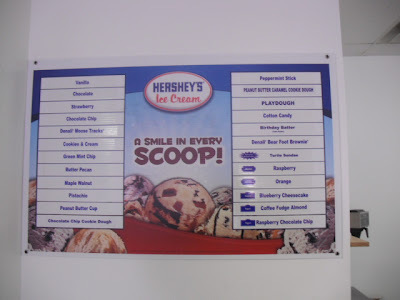 I thought about dessert-they have a full ice cream counter too. 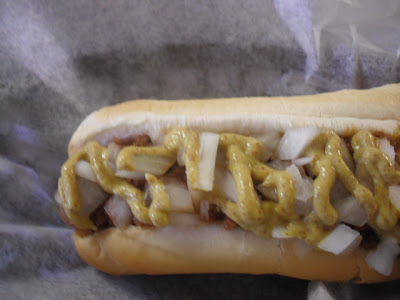 Instead I got a chili dog with onions and brown mustard (only half a picture because I bit into it before I remembered to take one)…. and an order of the hand cut fries for dessert! The chili dog had some zing to it. It wasn’t an eye ball bleeding spiciness, but I was blotting my substantial brow from the heat. I’d have either variety of hot dog at this place again! 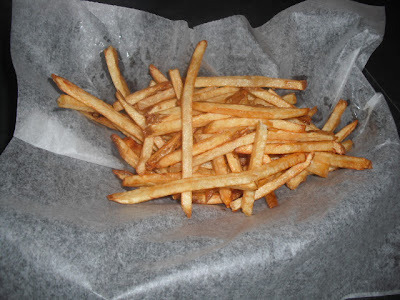 The fries were divine-fresh and golden brown and just perfect. Mrs. Hotdogman would like these fries, except she’d want poutine. I always pay for my lunch when I do my Hot Dog Stories, but Adam insisted my meal was on the house. I asked him if we were going to get in a fight over this and he said “you don’t really wanna mess with me, do you?” I looked at him. He’s a good 12-15 years younger, a half a foot taller and he’s got 100 pounds on me. 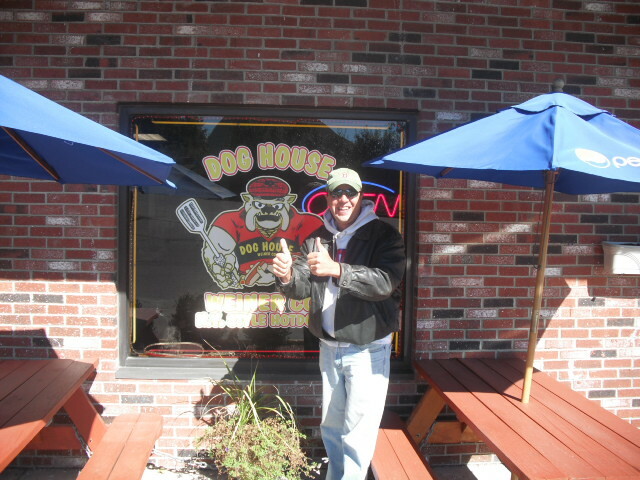 I definitely give the Dog House New York Weiner Company TWO THUMBS UP!